Education -- whether for the young or not-so-young -- is essential to the mission of the Greater Bridgeport Symphony. Some recent educational activities are described below. Eric makes new friends at High Horizon Magnet School in Bridgeport after a musical presentation. bring your family to the symphony! irst Prize winner Max Moon of Fairfield and Second Prize winner Kate Wegener of Easton are congratulated by Mrs. Jean Moffitt, GBS President, and Mrs. Doris Harrington, Chairman of the GBS Board of Trustees. Third Prize winner Eric Hirsch was unavailable for the photo -- already off to another competition! Honorable Mentions: Rachel Brake, French Horn; Ashley Lam, Oboe; and Briana LoCicero, Flute. GBS and the Hersher Family Foundation are pleased to congratulate the winners of the 2017 GBS Young Instrumentalists' Competition for Brass, Wind and Percussion, held at the University of Bridgeport on March 26, 2017. Talented students from as near as Fairfield and Trumbull competed against students from as far as Ridgefield and West Hartford, in an afternoon of fine music. Second Prize was won by Kate Wegener of Easton, who performed Williams’ Oboe Concerto and Mozart’s Oboe Concerto. Third Prize went to Eric Hirsch of Weston, for his renditions of Nielsen’s Concerto for Flute and Bach’s Sonata in E Minor. Honorable Mentions were conferred on Rachel Brake of Trumbull, French Horn; Briana LoCicero of Ridgefield, flute; and Ashley Lam of West Hartford, oboe. Competition winners Moon and Hirsch performed together at GBS' April 22, 2017 concert, opening the program for guest conductor Jonathan Yates. Bassoonist Max Moon, a senior at Fairfield Warde High School, won First Prize for his performance of C. M. von Weber’s Bassoon Concerto in F Major, followed by the Osborne Rhapsody for Bassoon, a solo piece. Moon plays in the Wind Ensemble at Fairfield Warde, and is a Music for Youth of Fairfield County Ambassador and leader of the Fairfield Woodwind Quintet. He has performed at Carnegie Hall as Principal Bassoonist with the Greater Bridgeport Youth Orchestra, accompanying the Tim Janis Band’s 2015 Christmas Concert and with Manhattan School of Music Pre-college Symphonic Orchestra at the 2016 International Music Festival. During his high school summers, Max has attended International Double-Reed Society at NYU, the World Youth Wind Symphony at Interlochen Arts Camp and the Young Artists Wind Ensemble at Boston University Tanglewood Institute. Max has enjoyed first seat in All State Connecticut Music Educators Association Western Regional and All State festivals in 2014 and 2015. He joined Manhattan School of Music Precollege Division in 2016 and studies with Harry Searing; he is a member of the Philharmonic Orchestra and a Chamber group at Manhattan School and is the recipient of the Paul Stebbins Bassoon Pre-college Scholarship. Max plans to double major in music and statistics in college. “We are always thrilled to provide this competition for the area’s young musicians. The depth of talent and passion for music never fails to impress,” said Jean Moffitt, President of the GBS Board of Trustees. The Hersher Family Foundation has funded this competition – and other GBS educational outreach in Bridgeport – for the past two years, honoring the legacy of Kurt W. Hersher. The contest was open to any student between 11 and 19 residing in Connecticut. Next year’s Young Instrumentalists’ Competition is already being planned, and will likely focus on piano. 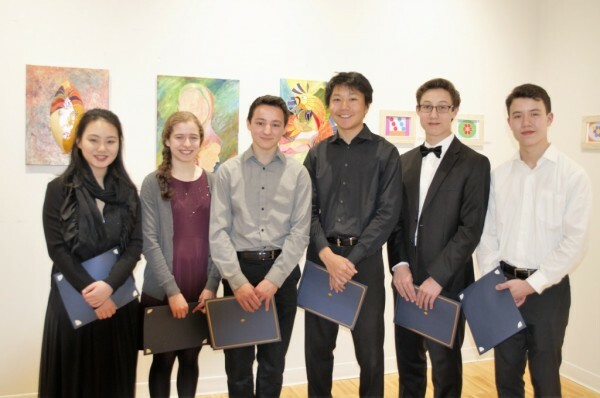 Past competition winners include Alexander Beyer, pianist of Fairfield, currently completing studies at Harvard University, who performed with GBS last September; cellist Allison Eldredge; pianist Andrew Armstrong; violinist Alexander Markov; and last year’s winner, cellist Julian Shively of Trumbull, who performed with GBS at their December 2016 concert at The Klein. Winners of the 2016 Young Instrumentalist Strings Competition: ChaeLim Yoon (honorable mention), Ellie Shapiro (2nd place), Julian Shively (1st place), Mark Xu (3rd place), Camden Archambeau and Benjamin Crosby (honorable mentions). GBS and the Hersher Family Foundation sponsored the 2016 Young Instrumentalist Strings Competition, which presented its awards on Sunday April 3, 2016. Fifteen talented students from towns as far as Riverside, Guilford, and North Haven competed, with the six finalists (above) performing in a free concert at the Littlefield Recital Hall at the University of Bridgeport. The competition was open to musicians age 11 to 19 who live in Connecticut. Julian Shively, a sophomore at Fairchild Wheeler Magnet High School, of Trumbull, won the competition after performing Dvorak’s Cello Concerto in B minor/ 1st movement allegro, and the Franck Cello Sonata, arranged by Delsart, 1st movement Allegretto ben moderato. Other top finishers were: Ellie Shapiro, 17, violinist, from Westport, Second Place, $250 award; and Mark Xu, 16, violinist, from Weston, Third Place, $150. Honorable Mention awards were presented to Camden Archambeau, 14, cellist from Weston; Benjamin Crosby, 17, cellist from Fairfield; and Chealim Yoon, 15, violinist from Fairfield. Judges were professional musicians of the Greater Bridgeport Symphony. This year’s competition was restricted to strings only; 2017 will be brass and wind instruments, and 2018 will focus on the piano. GBS rehearsed at Bridgeport's Bassick High School on March 14, 2017, and opened the doors to about 250 Bassick students. Shown here, conductor Eric Jacobsen speaks with the students about the music of Leonard Bernstein and Claude Debussy. Partial funding for this event was provided by the Hersher Family Foundation and by the City of Bridgeport. Deborah Wong and Eric Jacobsen perform for the music, drama and chorale students at Notre Dame High School in Fairfield, April 8. Jacobsen enjoyed bringing classical music to these students, whose music programs have been drastically cut. Of the Mahler concert, he says, “There is nothing quite as epic as a symphony orchestra building a Mahler symphony. It’s a journey like no other!” To this end, students were given the opportunity for complimentary tickets, and two dozen attended the concert. “They were absolutely awesome,” said one Central senior, “and Eric is so cool and funny; he gets so excited when he’s talking about music. Now I want to explore a whole new genre of music; you could hear so many emotions” in the music they played. See conductor Eric Jacobsen perform with a quartet of incredibly talented student musicians from the Greater Bridgeport Youth Orchestras, as seen CT Style on WTNH, Channel 8, on April 8. Jacobsen recently guest-conducted the Principal Orchestra of GBYO, working on Mozart's Magic Flute overture. On January 12, 2014, GBS reunited with GBYO for a family-centered, educational concert -- Amahl & Peter - A Family Affair, conducted by Christopher Hisey, GBYO Music Director. This was the first time GBS and GBYO had performed together in 30 years. In the first act, GBYO played Amahl and the Night Visitors; then GBS performed Peter and the Wolf, followed by a rousing side-by-side encore of Bizet's L'Arlesienne. The event attracted hundreds of area families to an afternoon of musical story-telling.